Flowers are the typically showy reproductive organs of angiosperms (flowering plants). Their diverse blooms generate countless horticultural products; functionally flowers are essential for sexual reproduction. Flowers may occur individually on the plant or together with other flowers forming inflorescences. Their flowers and inflorescences are: (1) highly adapted to the plant's ecology and pollination strategy; (2) highly variable among the flowering plants; (3) critically important to plant identification; and (4) subject to their own rich and specialized terminology. Morphologically and evolutionarily, the flower is regarded as a terminal shoot with variably leaflike lateral appendages . The stem of the flower, known as a pedicel, is connected to the other floral parts via the receptacle. From the outside rim of the receptacle, the first appendages are typically green, leaflike sepals , collectively called the calyx. The next whorl is composed of variously colored and often complex petals, collectively called the corolla. The androecium forms the next whorl, formed of stamens, each made of a filament and anther. Anther sacs are filled with pollen at maturity. Anthers release the pollen timed to match the receptivity of the female of either the same flower or others of the same species. The center of the flower is occupied by the gynoecium, which is formed of one or more carpels. Carpels may fuse to form a compound pistil or may remain separate and unfused. The carpel is divided into three regions, from the tip: the stigma, a receptive surface for pollen; the style, a specialized region for pollen tube elongation; and the ovary, a location where immature seeds called ovules occur, containing the female gametophyte or embryo sac. Meiosis occurs deep within the anther to produce many haploid male gametophytes (which become pollen) and deep within the ovule to produce the female gametophyte (or embryo sac). The group of angiosperms known as monocotyledons typically have floral organs in multiples of three, whereas dicotyledons have floral organs in multiples of four or five. Fusion of floral organs often occurs obscuring these parts and increasing the diversity of floral form. Similar organs fuse in the example of the corolla tube (as in the morning glory), but dissimilar organs fuse in the example of apple flowers. Organs may also be modified to perform different functions. For example, roses have five petals (as do most dicots), but some or all of the numerous stamens form petal-like staminodes, sterile petal-like stamens that give horticultural roses the appearance of having many more petals. Symmetry of individual flowers may be radial (forming mirror images around the center), or bilateral (forming mirror images along only one plane). 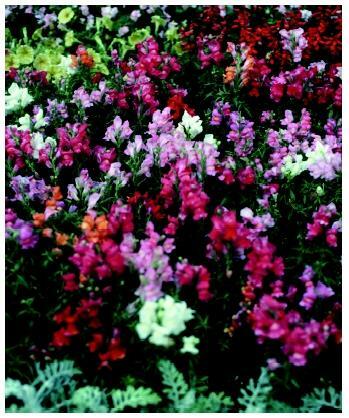 Snapdragons in bloom. Insects and other animal pollinators that visit flowers are often rewarded in return with pollen or nectar to assure this continued relationship. insects and other animal pollinators to visit the flower. In return, pollinators are often provided with a food reward of pollen or nectar to assure this continued relationship. After the flower is fertilized, floral organs, including petals, stigma, and style, die back while seeds form inside the carpels. The tissues surrounding the ovary are dramatically modified to become the fruit. Uno, Gordon E., Richard Storey, and Randy Moore. Principles of Botany. Boston: Mc-Graw-Hill, 2001. Young, Paul G., and Jacquelyn Giuffre. The Botany Coloring Book. New York: Harper Perennial, 1982. The largest flowers are species of Rafflesia, a carrion flower measuring up to 2 meters (6 feet) wide. This flower, native to the tropical rain forests of Sumatra, has no leaves or aboveground organs except for the flower. Living up to its name, Rafflesia attracts and is pollinated by carrion flies. The smallest flower is a duckweed. The smallest duckweeds are members of the genus Wolffia, with the whole plant measuring less than 1 millimeter (.039 inch) across. The flower of this plant is reduced to one pistil and one anther, which are borne on different plants. Other floral parts are vestigial or fail to form.